Whole Food Magic Meal... As pictured (optional with organic chicken or vegan) - Just add water, olive oil and chicken fillets or fresh vegetables. 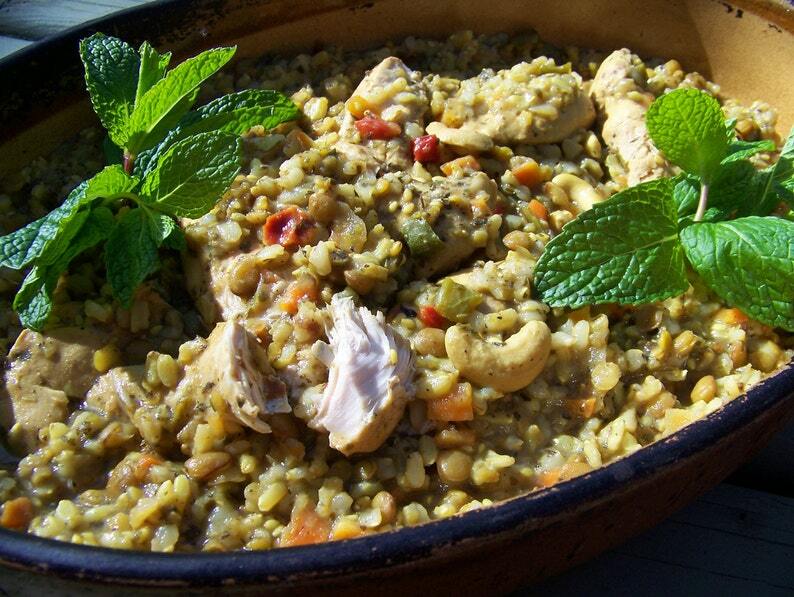 Stir with Cashew Curry Dinner Mix in a casserole dish and bake. 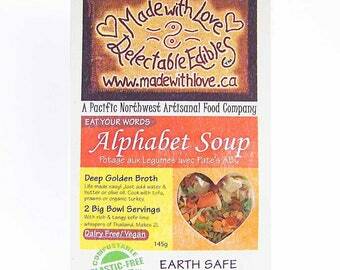 100% natural, handcrafted artisan blend of organic brown rice, raw cashews, lentils, sesame, veggies, herbs & spices. Gluten-free, Dairy-free, VEGAN, Organic Roasted Oven Dinner Mix or Easy Crock Pot / Slow Cooker Dinner Mix. Chicken Dinner Mix. Chicken Meal Mix. Roast Chicken Mix. Gorgeous to serve, this mild, rich and nutty oven dinner pleases everyone's taste buds. Not too spicy hot, but a gentle passport to the land of curries; with mild exotic spices belly-dancing in our veggie patch! Serve with fresh baby green salad and chapati, naan or fresh baguette. This Magic Meal makes two generous big bowl servings roasted with baby veggies and/or free range organic chicken. This simple entertainment quality meal will WOW your dinner guests and become an everyday staple in your pantry. Top this Complete Vegan/Vegetarian meal with loads of fresh baby veggies and/or organic chicken, pork or lamb for the omnivorous and roast all together. Baby eggplant, onion, garlic, whole baby beets, carrots, cherry tomatoes, peppers, mushrooms, baby potatoes, OR big chunks of cabbage, squash, cauliflower, brussel sprouts, sweet potatoes and yam all roast wonderfully with this mix. Choose your favorites! Or stir fresh chopped greens in right before serving...try baby spinach, parsley, kale, chard, cilantro, arugula or frozen organic peas! 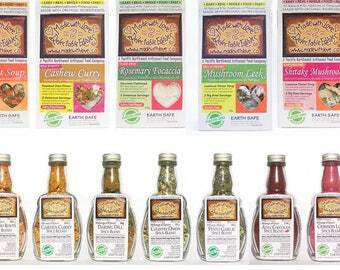 "Spices arrive every month beautifully packaged and the person I gifted them to loves them! Each month she says it's her new favourite. Will give this as a gift again!" "Thank you so much! Very easy to make, with very clear instructions, and so so tasty! :D"
"Nicely packaged and arrived so quickly. Great!" "Thanks so much great products! Love it all"
"Cute packaging! Safely packed, and shipped fast! I loved the entire experience. Makes for an awesome gift." "This is some wicked good stuff...just what I was hoping for! Can't wait to try some [Aztec Chocolate] in my coffee! Love the packaging too! Thanks!! :)"
"Cooking with Made with Love is so easy! 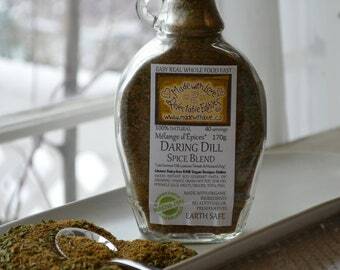 These spice blends are wonderfully balanced so you really can't go wrong. If you think it might taste good, no worries, it will!" Everything is Made with Love with 100% natural, Non GMO, non-irradiated ingredients. We work hard to source RAW & organic fair-trade ingredients direct from small organic farmers often and everything we create is made lovingly by real human hands. A gift for the spirit and a real blessing of the Earth. Made with Love products are Earth Safe: natural, hand-crafted, 100% Plastic-Free and sourced from the healthiest ingredients with the long-term health of our bodies and planet in mind. Made with Love Artisan Magic Meals master the art of Simple Gourmet Cooking! Every flavour can be mixed with a few fresh inredients to make Artisan Magic Meals in minutes. Ships nestled in our signature eco-gift wrap with dried flowers, herbs, twigs, spices hearts and 100% recycled fibre kraft tissue. A sacred gift of simplicity and ease for your self and the ones you love, our earth included. INGREDIENTS: Organic brown rice, Organic red & green lentils, whole raw cashews, dried leeks, onions, carrots, potato, sweet pepper, cabbage, celery, Organic unhulled sesame seeds, herbs & spices, unbleached raw turbinado sugar, sea salt. Our Kitchens blend products with legumes, nuts, dairy, wheat & other known allergens. We conscientiously clean between all batches with our allergenic loved ones in mind. We welcome payment directly with Visa or MC by phone to 250 554 5031 or by email money transfer.Thank-you for your conscious spending! Together we are changing our world. Our Motto: Happy Healthy People on a Happy Healthy Planet! Bought it for a Christian gift exchange and it was well received!! This was a beautiful gift! I’m sure it was as delicious as it looked, but I didn’t get to try it. The seller contacted be about the order to let me know about a substitute item, too. Pleasant experience all the way around!